Calling all Whiskey Lovers!!! Whiskey Business is tonight, Friday April 27th, 7-10 p.m. at the Cheyenne Saloon, 126 W. Church Street! 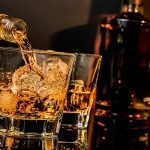 Patrons of this unique whiskey-centered event will enjoy discovering a huge selection of whiskies, bourbons, and scotches from around the world, as well as those distilled here locally. Guests will sample single malts all the way from Scotland, from new tastes to the classics. Brand ambassadors will be representing the best-of-the-best and are excited to share their wealth of knowledge! Ticket prices include entrance to the event, live entertainment, as well as appetizer samples from some of the hottest local restaurants around. Additional vendors will round out the evening, offering beer and cigar samples, and much more! Whiskey Business raises money for The Barber Fund, a small, grassroots 501(c)3 organization, established in 2014. The Barber Fund helps men, women, and children with various forms of cancer afford their basic utilities, mortgages, medical bills, grocery bills, and so much more (they even assist with animal care!). Ticket prices range from $20-$50. VIP tickets (entry at 6:00PM) are sold out, unfortunately.